Now that she has taught us “How to Take a Slutty Selfie,” rising actress-comedienne, Syd Wilder, best known for her breakout role as ‘Angel’ opposite Seth Rogan, James Franco and Jonah Hill in Sony Pictures’ entertaining apocalyptic horror comedy THIS IS THE END (released June 12th), is currently getting down with grandma in her latest YouTube sketch “How To Twerk with Seniors” (released Wednesday, September 18th), and we’d love to introduce you to this hilarious brunette bombshell to learn what it takes to be on her #twerk team! Born and raised in Atlanta, GA, Wilder moved to Los Angeles after graduating high school early to pursue her passion for acting and comedy and train at the prestigious American Academy of Dramatic Arts. She immediately landed the role of ‘Tammy’ opposite John Schneider in Syfy’s sci-fi action thriller SUPER SHARK and went on to shine in numerous supporting roles including Syfy’s sci-fi horror TV movie PIRANHACONDA (aired June 19th) as one of the snake’s ill fated victims ‘Vicki’ with Michael Madsen and Rachel Hunter and ‘Becky’ in Synergy Pictures’ romantic-comedy THE LOVE SECTION opposite Mekhi Pfeifer. Next year, this undeniably-stunning starlet will return to the silver screen alongside Mischa Barton, Billy Zane and Jonathan Bennett as the alluring temptress ‘Carla’ in Lock and Monkey Productions’ highly-anticipated romantic-drama MINING FOR RUBY (premieres 2014), a film that follows a widower dealing with his continued depression, who falls for ‘Ruby,’ a passionate environmental engineering grad student with a troubled past set in Fairbanks, Alaska. 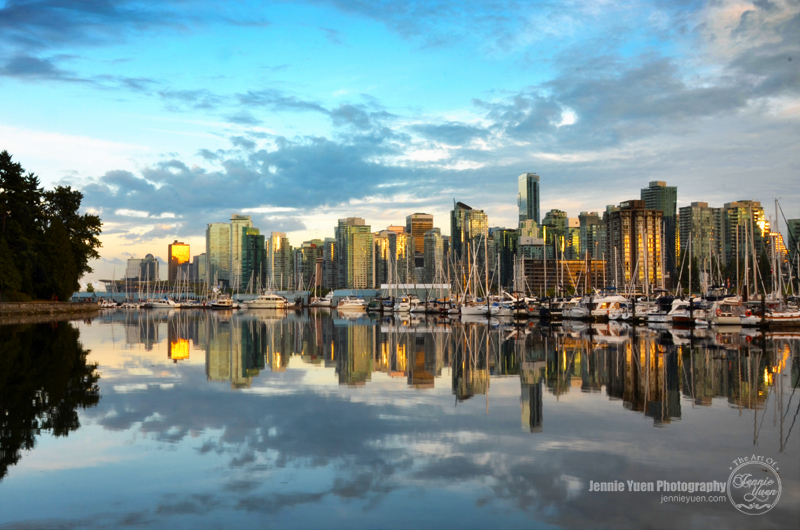 View of downtown skyline/cityscape of Vancouver, BC from Stanley park during the sunset hours. Welcome to the Soda Stream Giveaway! Co-Hosted by Barbara's Beat, Rainy Day Pennies, Capri's Coupons, Chronically Content and Simply Sherryl. Ever wanted to own one of these Soda Stream Makers? Here's your chance to enter and win your very own! "Touch - Button" Activation Has four preset buttons that allow you to choose the precise amount of carbonation to suit your taste. "Snap& Go" feature connects bottle to the machine for a secure seal and easy removal from the Revolution. Includes " Revolution" Machine, 1 60L Carbonator, 1 BPA free metal carbonating bottle, 1 BPA free black carbonating bottle featuring fizz-preserving stoppers to seal in the carbonation and 1 SodaStream 12 count Sampler Taste Kit. LED display shows carbonating process and amount of CO2 remaining in cylinder. Accommodates 60L and 130L carbonators. 2 Year Warranty to ensure your Revolution operates properly everytime. ONE (1) lucky winner will receive a Soda Stream Revolution Black Starter Kit (value $199)! Contest is open to US only, 18+ (ends October 21st, 2013 at 11:59pm EST). Winner will have 48 hours to respond. Be sure to come back daily for more chances to win. We appreciate the support of our sponsor, please show your support by following them on their social medias pages. Good luck! It’s here! Target is launching its new family friendly digital video streaming service, Target Ticket, with 30,000 movie and television titles to choose from including: World War Z, Iron Man 3, Star Trek Into Darkness, The Croods and more. · 30,000 movie and television titles available to buy or rent, download or stream at home or on-the-go, starting as low as $.99. · No subscription or sign-up fees, plus REDcard holders receive 5 percent off each purchase. · Premium selection of new blockbuster films. Current releases offered include “World War Z,” “Iron Man 3,” “Star Trek Into Darkness,” “The Croods” and more. · More than 50 popular next-day television shows including “The Walking Dead,” “Big Bang Theory,” “Teenage Mutant Ninja Turtles” and more. · Viewers can watch rented content as many times as they want within a 48-hour rental period. · Target exclusive bonus footage available in select movies. · Target Ticket will offer 10 free downloads on select movies for each new guest. SIGN UP TODAY and receive 10 free downloads on select titles! Will protecting children throughout the world cost Natasha her own family? Devastated by the loss of her brother, Natasha Senecot works to expose the dangers of Matthew Chrysler's violent video games, succeeding in bankrupting and humiliating him. Chrysler retaliates and sends a hit man after her. Natasha is forced to fake her own death to protect her children, but after witnessing another tragedy, Natasha won't hide any longer. In a race against time, can Natasha expose Matthew Chrysler before his assassin murders her family and shatters her world? I had the chance to read another one of Cami's wonderful books. She is a brilliant writer. There's some interesting drama in this story (if you're into drama). Lots of suspense and what was happening between the characters is kinda unpredictable. You just never would think that would happen. It really got me hooked on to find out what was going to happen next. Cami Checketts is a part-time author, part-time exercise consultant, part-time housekeeper, full-time wife, and overtime mother of four adorable boys. Sleep and relaxation are fond memories. She’s never been happier. She is also the author of The Broken Path, Dead Running, Dying to Run, The Sister Pact, The Fourth of July, and Poison Me. Follow her on her blog, Twitter @camichecketts, and/or Facebook Page to stay up-to-date about the author, promotions, and upcoming releases. To celebrate the new release, Blog This will be $2.99 during the blog tour - September 30th - October 16th. Click here to purchase or read the first few chapters. Also, enter the contest below to win some fabulous prizes! Disclosure: I received a complimentary ebook copy of the mentioned book for my review. My opinions are my own and may differ from those of other consumers. Welcome to the $100 Victoria's Secret Gift Card Giveaway! Thanks to all our wonderful co-hosts for helping us making this giveaway one great event! Who doesn't love Victoria's Secret? So girls, this is your time to get a chance and win $100 worth of shopping at your favorite store. Get ready for pink giveaway, it is here now. Grab your entries now! ONE (1) lucky winner will receive a $100 Victoria's Secret Gift Card. Contest is open WORLDWIDE, 18+ (ends October 31st, 2013 at 11:59pm EST). Winner will have 48 hours to respond. Be sure to come back daily for more chances to win. We appreciate the support of our sponsor, please show your support by following them on their social medias pages. Good luck! Ever get that feeling while you're at work or at home and you get this sudden headache while you were working in front of your computer for long periods of time? Yes, I get that feeling sometimes and it's not pleasant. And I hate the idea of going through my medicine cabinet for those pills. I was recently introduced to UrgentRx. UrgentRx is a line of powder medications for fast-acting relief. It's a must-have product which targets consumers who have busy, always on-the-go lifestyles. Slip the credit card sized package in your pocket while traveling, and be on your way! I was also given the opportunity to try all 5 of the samples: Headache, Heart Burn, Allergy Attack, Upset Stomach, Ache & Pain, and Critical Care (Aspirin). I received them nicely packaged in a card-holder case. UrgentRx is a credit card sized packet containing fast-acting medication in the form of a powder. Jordan Eisenberg watched his dad carry around tablets as a precaution for a heart attack and he himself sported antihistamines for allergies and knew there had to be something better. UrgentRx uses the same active ingredients as the leading brands, fits right in your wallet and no water is needed-just rip open the package and pour the dissolving powder directly into your mouth. The flavored powder medications go into the blood stream 2.5 times faster and relieve you of your symptoms 2.5 times faster than pills. These individual packages are also perfect and convenient for travelling. Disclosure: I received samples of the UrgentRX Powder Medicine from the PR Firm/Company for review. The opinions expressed are my own personal and honest thoughts. No other compensation was given. Britney finally decided to stop teasing us – just now, the pop star released the first images of her new fragrance fantasy anniversary edition. The news comes following a teaser ad the queen of pop sent earlier this week, and we couldn’t be more excited for the perfume’s debut! One decade ago, a world-renowned pop star put her faith in her fans and launched a fragrance – the iconic curious BRITNEY SPEARS™. An instant hit, Britney’s fans went wild for the entertainer’s perfume and one of the most acclaimed celebrity fragrance franchises ever was born. Now a global, billion-dollar fragrance franchise, Britney Spears™ is one of the few celebrity perfumers to have reached the 10 year milestone. In honor of the occasion, the pop icon-turned-perfumer is celebrating in a very big way. The fragrance, fantasy anniversary edition commemorates Britney’s 10th year of creating fragrances. It’s a celebratory scent to mark 10 years of perfume in the making (remember curious?) and Britney’s now global, billion dollar fragrance business. The packaging – if you look closely, you’ll see names listed all over the packaging for fantasy anniversary edition. Those names happen to be of Britney’s most devoted fans from over 85 countries. This is a first-of-its-kind campaign in the fragrance industry, using fan names as a muse for the package design. The bottle – see the message on the bottle? It’s a note from Brit to her fans thanking them for 10 years of support. She’s dedicating this landmark fragrance to them! Each bottle size has a different message, together saying “10 hugs and 10 kisses…to my sweet scented fans for a decade of love…you are my inspiration,” with the signature “xoxo Britney” beneath each message. Availability – The scent will be available in early October, exclusively at Kohl’s and Kohls.com. This is Emma and Olivia's first project together and recently did an ad campaign shot by Steven Klein in LA. The actresses had a lot of fun on set giggling and fooling around, and looked beautiful doing it. The make-up on set was gone by celebrity make-up artist and Revlon Global Artistic Director Gucci Westman, who designed the color scheme of the collection. The much-anticipated Fall/Winter 2013 color collection by Revlon Global Artistic Director Gucci Westman is a celebration of makeup, bringing together a dazzling palette of rich purples, feminine violets and emeralds for the eyes, glistening plums and fuchsias for the lips, and graphites and matte sparkles for the ultimate nail jewels. The Evening Opulence Collection by Gucci Westman for Revlon Fall/Winter 2013 is your VIP pass to full-fledged glamour and color. Where over-the-top brights and jewel tones give sparkle to your night. Live a colorful life with The Evening Opulence Collection by Gucci Westman for Revlon Fall/Winter 2013 starting this October. With Fall around the corner, markets are overflowing with produce that is the essence of the season. While the weather gets cooler, it only seems natural to eat vibrant and hearty root vegetables roasted to perfection. So this autumn, incorporate the season’s bounty in Alter Eco’s Quinoa and Roasted Beet Salad. In this recipe, Alter Eco Royal Pearl Quinoa ties the warm, earthy beets together with the decadent goat cheese; It’s perfect for curling up and savoring on cool fall day. Royal quinoa (or “quinoa real”) is grown only in the Bolivian Altiplano on the edge of the salt flat and at the foothill of Andean volcanoes. Like with Champagne, Royal Quinoa can only come from this part of the world. Royal quinoa is grown at 13,000 feet above sea level and the harsh conditions dictate that only the strongest and most resilient quinoa grows and thrives there. As a result, royal quinoa is believed to be larger, nuttier and more nutritious than other types of quinoa. Additionally, the richness of the soil in the Bolivian Altiplano contributes to the special qualities of the royal quinoa, as does the expertise of the farmers there, who have generations of skill and know how in growing this product. Alter Eco is the exclusive U.S. provider of Royal Quinoa due to their relationships with the cooperatives in this special part of Bolivia. 1. Scrub and roast the beets. Once they are cooled, remove the skins and cut into 1/4-inch dice. Set aside. 2. Blanch the greens in a large pot of generously salted water or steam them above an inch of boiling water until wilted, one to two minutes. Refresh with cold water, squeeze dry and chop. 3. Heat the olive oil over medium heat in a large, heavy skillet. Add the garlic. Cook, stirring, until fragrant, 30 seconds to a minute. Add the caraway, beet greens, and salt and pepper to taste. Stir over medium heat for 30 seconds to a minute until the greens are nicely infused with the garlic and oil. Add the beets and quinoa. Toss together until the ingredients are well combined and the quinoa is heated through and colored with beet juice. Taste and adjust salt and pepper. Transfer to a wide serving bowl or platter, and sprinkle the goat cheese over the top. To celebrate the welcoming of Fall, SLR Lounge is celebrating with a giveaway and have partnered with Calumet Hollywood and Kelly Moore. Enter HERE for your chance to win these fabulous prizes! Summer is over. It's already officially Fall and weather is getting cooler. The leaves on the trees are starting to change their colors. 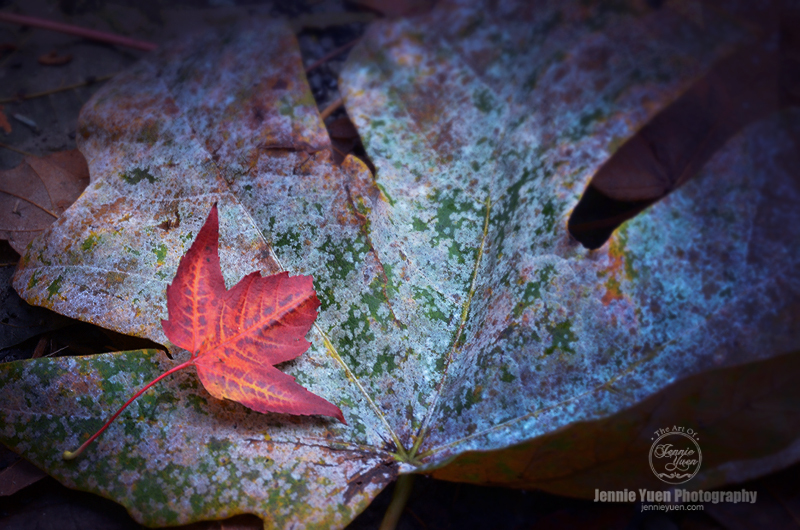 Here I've captured a small, bright red Maple Leaf laying on top of a larger decomposed Maple Leaf. All birds of prey are my favorite kind of birds. 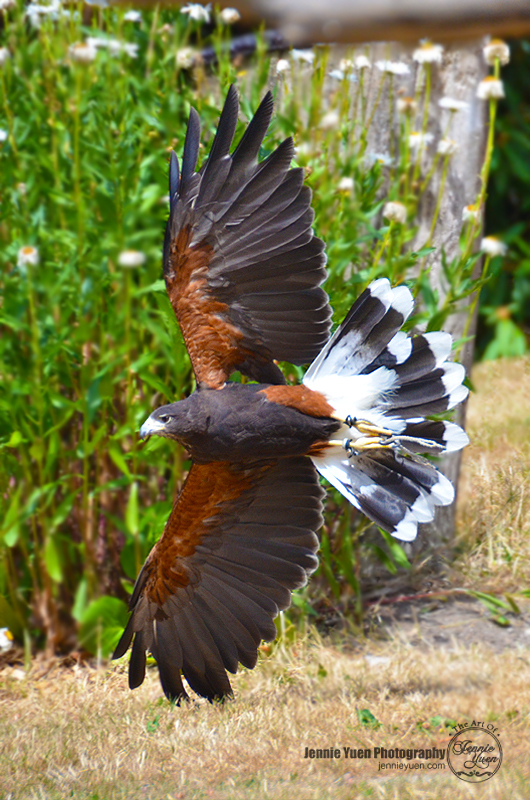 The photograph taken below is the Harris's Hawk. They have dark brown plumage with chestnut shoulders, wing linings, white on the base and tip of the tail, yellow legs and a yellow cere. It is absolutely a beautiful bird. Actress and singer, Ashlee Simpson attended the Entertainment Weekly pre-Emmy party at Fig & Olive Melrose Place on September 20, 2013 in West Hollywood, California. The gorgeous blonde accessorized her red carpet ensemble with a fringe clutch by New York based handbag designer, Katherine Kwei. She truly epitomized dark-romance throughout her entire look. Actress Drew Barrymore was spotted in NYC wearing Sunday Somwhere Alita sunglasses for the second time. The blonde beauty looked gorgeous in a coordinated denim and cable knit sweater combo paired with the ultra chic sunnies. On a different day, Drew Barrymore was seen in black trousers and a floral printed top paired with the exquisite frames. Drew is known for her unique sense of style and this ensemble epitomizes her feminine taste with a touch of her signature bohemian flair. Sunday Somewhere is the brain-child of eyewear aficionado, Dave Allison. Late in 2010, his singular vision of creating an eyewear and optical collection focused upon detail, quality, simplicity and originality. Sunday Somewhere's aesthetic is influenced by both the past and future. With references to classic vintage frames, intricate modern detailing and futuristic materials, the finish is practical, a wearable modernity. This 'classic with a twist' collection makes Sunday Somewhere fresh, covetable, and timeless. Attention bloggers: This is a free/paid blogger event organized by Mom Powered Media Link is free when you post about the giveaway on your blog and a thank-you for participating in the event. * FREE link on entry form (Twitter only) with announcement post (or pay $5 waiver fee if not posting announcement).